From styling cream and sunscreen to fedoras and headbands, here are 20 products and accessories that will keep your hair looking healthy and fashionable in warm weather. Don’t let humidity and frizz get you down this summer. Use Living Proof Straight Making No Frizz Styling Cream ($24) to keep your straight hair in place and looking great. The styling cream can be applied to wet or dry hair, which is perfect if you want to take a break from your blowdryer. If your hair is lacking luster and shine, apply some Ojon Revitalizing Mist ($26) before or after styling. It’ll keep your hair looking shiny and gorgeous in the summer sun! If you’re planning a camping trip this summer or if you’re just a gal on the go, try Klorane Dry Shampoo With Oat Milk ($7.50 for the travel size, $18 for the regular size). It’s perfect for when you don’t have the time or amenities to take a quick shower. 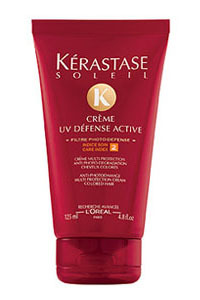 Kerastase Creme UV Defense Active ($36) is a must-have if you are planning to spend all summer in the sun. Apply the creme to wet or dry hair before going out to protect your hair from UV damage. Is your hair dry and suffering from the sun’s effects? Then try Oscar Blandi Proteine di Jasmine Protein Mist for Restyling Hair ($18) to protect hair from the inside out. The mist also detangles and keeps hair shiny and sleek.